Right around the corner from our office is a restaurant that has had more than its share of failures. Although it was home to Pesca many years ago (as in the early 80s) where Danny Meyer first got his taste of the hospitality business, it has been a bust for as many years as I’ve been working in the Flatiron district (the past 10+ years). It’s brightest moment was as Rocco’s home during his brief period of fame. The latest brave souls to take a shot at this space are Jeffrey Chodorow and Zak Pelaccio. Zak is the genius behind Fatty Crab so you have to give him a decent shot at making this place work. 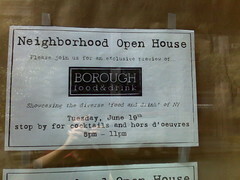 The place is called Borough and the concept is the "best of NYC". Hmm. Not exactly sure what that means but given that its around the corner from our offices I’m sure we’ll get a chance to tell you. The reason for this post is on my way to the office earlier today, I snapped this photo (with my new Blackberry Curve oh yeah!) and emailed it to Flickr. And now I am blogging it. It’s an invitation to an open house tomorrow night. I won’t be in town, but the doors are open so go check it out. Newer post To All The Entrepreneurs We’ve Backed Older post Is Jerry Yang The Next Steve Jobs?